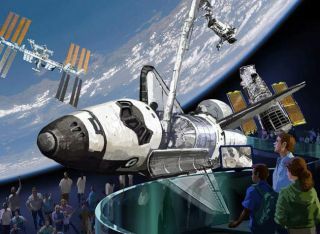 An artist's rendition reveals Kennedy Space Center's plans for a $100 million, 64,000 sq. foot space shuttle exhibit. Plansare moving forward for the display of two of NASA's soon-to-be-retiredspaceshuttles at the Smithsonian and Florida's Kennedy Space Center. AlthoughNASA has yet to announce where its orbiterswill be dispatchedonce they ceaseflying missions next year, recent actions have helped remove obstaclesandclarify the logistics for the Washington, D.C. institution and the CapeCanaveral, Fla. spaceport to receive shuttles. Inthe case of the Smithsonian, it was long thought to be the future homeofshuttle Discovery, NASA's oldest flying orbiter. Recently, budgetconstraintscalled that plan into question. Asfirstreported by collectSPACElast month,NASA was not prepared to cover the estimated $28.8 million needed toprepareand transport the shuttle to the institution. NowCongress is passing legislation to make NASA do just that. TheKennedy Space Center Visitor Complex wouldn't incur the costs to fly ashuttleto its facility ? it would simply need to roll the orbiter down theroad. Butup until now, the tourist attraction has trailed many of the other 20shuttlesuitors releasingtheir display plansfor an orbiter,assuming they were granted one. OnWednesday, the visitor complex revealed its intentions to build a $100millionexhibit to showcase a shuttle. WhenNASA first said it was reserving Discovery for the Smithsonian in 2008,theagency made it clear that the custodian of the National Collectionwould stillneed to cover the then-estimated $42 million to ready and deliver theshuttle. Thecost, which lowered to $28.8 million at the beginning of this year, wasstillsaid to be beyond the Smithsonian's reach, according to sources closeto theNational Air and Space Museum who spoke with collectSPACE. TheSmithsonian refused interview requests, but public documents showedthat the NationalAir and Space Museum's total annual budget ? including the NationalMallbuilding; its Chantilly, Virginia-based annex, the Steven F. Udvar-HazyCenter;and the Paul E. Garber Preservation, Restoration and Storage Facilitylocatedin Suitland, Maryland ? was about equal to the $28.8 million requiredby NASA. Asa result, for the first time since the discussion began about where theorbiters would go, Discovery seemed like it might be up for grabs. Thatis,until Congress decided to get involved. Onthe evening of Dec. 8, the House of Representatives narrowly passed ayearlongcontinuing resolution (CR) to fund the federal government. The billincluded abudget for NASA and "an interesting shuttle provision," as describedby Jeff Foust writing on his blog SpacePolitics.com. "TheCR devotes nearly a page to issues associated with the disposition ofshuttleorbiters... in particular cutting a special deal for the Smithsonian,"Foust reported. Thespending bill excuses the Smithsonian from bearing the costs fortransportationand preparing a retired orbiter for display. "Shouldthe Administrator determine that the Smithsonian Institution is anappropriatevenue for an orbiter, such orbiter shall be made available to theSmithsonianat no or nominal cost," the resolution reads. TheSenate has yet to take up its own version, but a draft of the omnibusappropriations bill released on Wednesday included the same language. Ifso, then the Smithsonian's plan is to replace the prototype shuttleEnterprise,now on display in the McDonnell Space Hangar at the Udvar-Hazy Center,with theflown-in-space orbiter. Continuereading atcollectSPACE to learn thedetails of the Kennedy Space Center?s $100 million, 64,000 square footspaceshuttle display.